Consumer Buying Behaviour, Advertisement, Entertainment, Familiarity, Advertisement Spending, Social Imaging. Advertising is a way of communication to encourage an audience for making purchase decision about a product or service and conveying information to viewers. It is considered as a vital and essential element for the economic growth of the marketers and businesses (Ryans, 1996). Advertising is usually a paid form of exposure or promotion by some sponsor that reaches through various traditional media such as television, newspaper, commercial radio advertisement, magazine mail, outdoor advertising or modern media such as blogs, websites and text messages (Ahmed & Ashfaq, 2013). Marketers have always adapted to changing business demands when it comes to creating new advertisements. The use of advertisements has significantly increased in the 20th Century as industrialization expanded the supply of manufactured products. However, not many businesses practiced advertising at the time. During the late 80s advertisements were fairly limited to television, radio, billboards and newspapers. In the modern times, businesses are leaning towards Digital Advertising. Companies are so focused in social media and mobile advertisements that they may take over Television advertisement very soon. In Bangladesh, the trend of Digital Marketing is just on the bloom. Most large local and multinational giant companies are now practicing digital marketing in full swing. The major aim of advertising is to impact on buying behaviour; however, this impact about brand is changed or strengthened frequently through people’s memories. Memories about the brand are formed by associations that are related to brand name in consumer mind (Khan, Siddiqui, Shah & Hunjra, 2012). These brands continuously influence consideration, evaluation and finally purchases (Romaniuk & Sharp, 2004).Consumers buying behaviour has always been given so much importance and space in the literature study of impact of advertising regarding its effectiveness (Ajzen, 2002). Most of the time consumers buying behaviour depends on liking or disliking of consumer towards the advertisement of the product advertised (Smith et al., 2006). A good quality advertisement is likely to influence consumers into buying that product while a poor quality advertisement will do the opposite. Previous studies have been conducted on effectiveness of advertisement and on advertisement’s impact on consumer buying behaviour which depicted positive relationships. However, in this paper we have introduced a combination of different variables and attempted to examine their influence on consumer behaviour. This paper aims to determine which of these variables carries the most importance in terms of effecting consumer behaviour and which of these variables carries less significant impact. This will help marketers to focus on the right factors and achieve maximum benefit from their advertisement. We believe that the study will offer useful insights for both advertising scholars and executives to understand the ins and outs of advertising and to assist marketers in introducing better approaches to advertising. 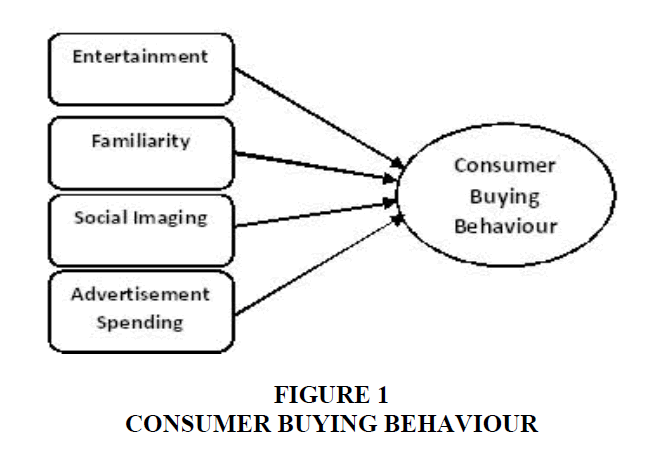 Maheshwari, Seth & Gupta (2016) in their article “An empirical approach to consumer buying behaviour in Indian automobile sector" has concluded that advertisement effectiveness positively influences consumer buying behaviour. Ha, John, Swinder & Muthaly (2011), in their research paper "The effects of advertising spending on brand loyalty in services" have discovered that advertising spending has impact on consumer’s perceived quality of the product, consumer’s loyalty and satisfaction level. Kumar & Raju (2013) in their paper “The Role of Advertising in Consumer Decision Making” have found that advertisements are able to change the consumer’s opinion about a particular product. Advertising has always known to be one of the key factors that affect consumer’s decision making process. In this paper, we have attempted to combine different sets of variables from these previous studies to test and analyse how they impact consumer’s buying intention. Entertainment has been one of the primary criteria for creating an advertisement. Entertainment is used as a tool to gain attention of customers. An interesting and entertaining ad is more likely to be remembered by consumers rather than a boring one. Therefore, it can be said that entertainment increases the effectiveness of advertising. That is why many companies are investing a lot of money to make advertisements that are humorous (Mandan, Hossein & Furuzandeh, 2013). Former studies suggest that entertainment in advertising generates customer satisfaction (Chang, 2006). This claim was tested by later empirical studies. For instance, Duncan and Nelson (1985) conducted a research on how entertainment in advertisement affects consumers. They analysed 157 responses towards advertising and found that entertaining advertisements can influence consumers. It influences consumers into accepting and consuming the product (Duncan & Nelson, 1985). In a similar way, Chang (2006) investigated about entertaining advertisements and its influence on consumer satisfaction and leave impact on their behavioural intentions. Based on his research on 152 participants, he found that entertaining advertising can positively increase consumers’ satisfaction, thus influencing consumer buying behaviour. Although use of humour in advertisements can be risky at times as a large number of people may not be entertained by the same concept. Gulas and Weinberger in their book say that a failed attempt to entertaining ads is a lost opportunity to connect with consumers. It may even offend consumers and drive them away. They have exemplified this risk with a 1999 Super Bowl advertisement for ‘Just for Feet’. It showed a group of white men tracking a barefoot, black Kenyan runner who was later drugged and forced against his will to wear a pair of running shoes (p. 174). The advertisement was met with massive outrage (Gulas & Weinberg, 2006). However, entertaining advertisements do not necessarily mean humorous ads. Thrilling, full of suspense advertisements can also be counted as entertaining. One of the biggest examples of all time is the Apple super bowl commercial “1984”. It left people awestruck and it was immediately able to get attention of people. It was very effective in terms of spreading news about a new era of computers. It also had a huge part in generating sales for the company. Harvard professor Teixeira has conducted an interesting study on this regard and wrote a paper “Why, When and How much to entertain consumers in advertisements?” The study is based on a facial tracking study (software used to track the facial emotions) in response to the TVCs. This is a first of its kind study and is the latest (Teixeira, Picard & Kaliouby, 2013). Teixeira found that entertainment plays both a co-operating and a conflicting role, depending on its type (i.e., location in the ad). Entertainment that is associated with the brand is co-operating, as it acts as a persuasion device both in the interest and purchase stages. Entertainment that is not associated with the brand acts predominantly as an attraction device at the interest stage, thus indirectly cooperating but also directly conflicting with the ultimate goal of the ad. The previous research as provided us with diverse information about the impact of entertainment on consumers. It is seen to influence consumers in a positive way by grabbing their attention and creating a lasting impression. However, in some cases the impact was negative. In this research we will attempt to find out if these varied impressions about entertaining advertisements really have any impact on consumer’s buying intention. Alba & Hutchison (1987) defined familiarity as the number of product-related or service-related experiences that have been gathered by the consumer. These related experiences include direct and indirect experiences such as exposure to advertisements, interactions with salespersons, word of mouth contact, trial and consumption. Johnson and Russo (1984) viewed familiarity as being tantamount with knowledge. Johnson & Kellaris (1988) have considered experience contributing to familiarity. Review of the literature shows that knowledge; experience and familiarity are closely intertwined. Following Alba and Hutchison’s (1987) definition, brand familiarity is identified as the accumulated correlated experiences that customers have had with a brand (Ballester, Navarro & Sicilia, 2012). The effect of brand familiarity can be observed through a process called ‘Product-class cues’. The product class or subcategory to which the brand belongs could serve as a cue in many cases. A consumer may want a "fruit juice" to have with a meal. Research on categorization processes has recognized the importance of "prototypically" as an indication of the strength of association between a category concept and members of the category (Rosch, 1975; Medin & Smith, 1981). Prototypically of a brand is known as a measure of how representative the brand is of its product category. Operationally, prototypically is measured by individuals' ratings of how "good an example" they consider the object of a category. Brands that are prototypical are more likely to be recalled faster and more frequently (Nedungadi & Hutchinson, 1985; Barsalou, 1985; Rosch & Mervis, 1975). This leads to a higher probability of being included in the evoked set and to higher probability of choice. Zajonc (1968) in a research has demonstrated that experience to a stimulus can enhance the fondness for that stimulus independently of cognitive evaluations or contextual associations. Basically, this stream of research has confirmed that affect is a linear function of the logarithm of exposure frequency (Harrison, 1977). So, as exposure to a brand increases, affective reactions to the brand become more favorable. It means the more a brand is exposed through advertisements and campaigns, the more exposure it gets, which eventually leads to more familiarity of the brand. Zajonc & Markus (1982) suggest that familiarity may lead to creation of positive impression of a service or object. When confronted with a familiar service or brand, the consumer may feel a glow of warmth and intimacy. Familiarity with the brand thus creates a sense of trustworthiness in consumer’s minds. The previous researchers have all identified how familiarity towards a brand causes a psychological change in the minds of the consumers. It is seen that familiarity mostly evokes positive emotions about a brand on the consumer’s mind. This paper will attempt to find out whether these changes in the psychology, eventually lead a consumer to purchase a product or not. Advertisements generally have influence on how we perceive things around us. Through various types of advertisements, especially TVCs portray how a user of a certain product is or should be. It sometimes shows the social class the user of a product belong to, their lifestyle and attitudes. In cases of beauty product this concept is highly applicable. In a research conducted in 2009 it was observed that one of most influential ideas spread by the media is society's perception of beauty and attractiveness. The thin beautiful woman and the handsome muscular men are seen everywhere. And as the influence of media increases, the pressure to hold on to these ideals increases (Russello, 2009). In 2008, the YWCA USA published a report, Beauty at Any Cost, which highlighted the consequences of the beauty obsession on women and girls in America through media. This feeling of insecurity and obsession is very much likely to trigger purchase of beauty products (Britton, 2012). The mass media is the most powerful way to spread these images that represent sociocultural ideals (Tiggemann, 2003). Advertising promote social messages and life style by illustrating the position of ideal consumer and stimulates consumer’s willingness to purchase (Pollay & Mittal, 1993). Apart from the beauty industry, another great example of social image that is solely created by advertisement is the brand “Rolex”. It is not necessarily the best product in the market nor does it add a lot of usefulness to one’s life in this day of cell phones. But through its careful ad placements they have gained the attraction of millions. They have targeted sports and club members of the elite and portrayed them in their advertisements. They have identified how the lifestyle of an ideal customer of their product is, where they live, where they hang out, etc. In a way they have sent a subliminal message to the people that ‘Rolex’ is only for the rich and sophisticated, it is what sets a person apart from the ordinary. Rolex is now more of a social status rather than a time tracking device. As a result, a person who has suddenly become rich would want to buy a Rolex just to have a sense of belonging in that ‘elite’ class. “Apple may be the numerouno smart watch seller in the world and while it can revel in the fact that it thwarts its wearable rivals such as Samsung, Sony and LG in this sphere, the Cupertino-based company is still not a shine on Swiss watchmaker Rolex, which is synonymous with luxury”. Prior studies have shown that stereotyping and classification of a certain gender or group of people has a huge impact on mass population. People feel pressurized to look a certain way to get a feeling of belonging. This may have both positive and negative impact on the society. But in this research, we will focus on finding out if ‘social imaging’ in an advertisement is successful in persuading people to purchase a product by inducing their desire to belong in a certain social class. Advertising spending can have an effect in the buying behaviour of people in a sense that the more money spent can be linked with the quality of advertisement and the frequency of advertisement. It may result in creating a lasting impression in consumer’s mind. Advertising is an important extrinsic cue signalling product quality (Milgrom & Roberts, 1986). Heavy advertising spending shows that the firm is investing in the brand, which means the organization has a huge investment and thus implies that they might have a better quality of product (Kirmani & Wright, 1989). In addition, advertising spending levels are good indicators of not only high quality but also good buys (Archibald, Haulman & Moody, 1983). Yoo, Donthu & Lee (2000) examined the impact of the marketing mix variables on consumer behaviour. The approach focuses on the indirect effect of these determinants on brand loyalty. Since advertising spending affects expectations of product or service quality in consumer’s mind (Kirmani & Wright, 1989; Yoo, Donthu & Lee, 2000; Moorthy & Zhao, 2000), its role should be indirectly linked to brand loyalty implying that rather than the advertisement itself, it is how advertising affects customer perception of the firm that is more critical in impacting consumer buying behaviour (Ha, Janda & Muthaly, 2011). The earlier studies have concluded that when a huge sum is spent on advertisements and other marketing campaigns consumers began to expect more from that particular brand. It creates and illusion of better quality of product or service from that brand. In this study, we will try to find out that how these associations that consumers make with ‘Advertisement Spending’ and the ‘Brand’ effect their purchase decision. In other words, we will attempt to find out how consumers perceive advertisement spending and if it ultimately influences them to purchase the product. Consumer buying behaviour refers to the methods involved when individuals or groups choose, buy, utilize or dispose of products, services, concepts or experiences to suit their needs and desires (Solomon, 1995). A behaviour that consumers display in searching for, paying for, using, evaluating and disposing of products and services that they think will satisfy their needs (Schiffman & Kanuk, 2007). It is a convergence of three fields of social science, they are, individual psychology, societal psychology and cultural anthropology (Ramachander, 1988). A theory that answers what, why, how, when and where an individual makes purchase (Green, 1992); it is particularly important to study the subject of consumer buying behaviour as it facilitate firms to plan and execute superior business strategies (Khaniwale, 2015). Nowadays, people have access to the endless supply of advertisements. However, they fancy something new, entertaining and something that can grab their attention. Boring advertising will not sustain in consumers’ minds long enough. Therefore, entertainment has been termed as a significant advertising strategy for increasing advertising effectiveness and imploring them to make a purchase (Madden & Weinberger, 1982). Familiarity created by advertisement for a certain brand is also an important factor that affects consumer buying behaviour. Macinnis and Park (1991) carried out a study with consumers to investigate the effects of familiar songs in advertising and consumer behaviour. In their research, consumers depicted satisfaction for products with familiar songs and a significant relationship was confirmed between the level of familiarity of the songs in the advertising and its amiability. Social role and image reflects that ads influence individual life style and the extent to which an individual seeks to present him or herself in a socially acceptable manner. In addition to selling products and services, ads sell image and life style. Consumers learn about new life style, image and trend through ads (Pollay & Mittal, 1993; Burns, 2003). Advertising promote social messages and life style through illustrating the position of ideal consumer and stimulate social action toward purchase of that product. Advertising spending also creates positive impression about a brand in the minds of the consumers. Aaker and Jacobson (1994) also find a positive relationship between advertising and perceived quality. Hence, advertising spending is positively related to perceived quality, which leads to greater amount of purchase from that brand as consumers generally prefer to purchase from a well know brand in order to avoid disappointments over quality. The influence of advertisement and how advertisements work is a question that most marketers and managers try to find an answer to. The primary objective of advertisement is usually to impact the consumer’s buying behaviour. Most of the time consumers buying behaviour is influenced by liking or disliking of consumer towards the advertisement of the product, advertised (Smith & Neijens, 2006). In the words of Gorn (1982), the consumer behaviour towards a product is wholly depending on advertising, without any consideration of the features of the product. To analyse more about the effects of advertisement and the factors of advertisement that influences the consumer buying behaviour, a conceptual framework is built. The hypotheses for this research are formulated based on the literature review to build a conceptual model for the research (Figure 1). This study required a structured and definite plan to identify the relationship between different variables and test hypotheses. For this reason, this research was conducted following the formal research design. The data collection technique used in this study comprised of playing out an up close and personal meeting with the respondents who are consumers of any product or have been exposed to any sort of advertisement. The review poll was planned and conveyed to target respondent arbitrarily. All together for the research to deliver a reasonable result, the data must be comprised of a large number of populations. Hence, the survey was conducted among 544 consumers. As the research framework indicates, there are four independent variables and one dependent variable. So an adjustment in the independent variable will change the dependent variable. In this manner, to examine the research questions and test the theory a Causal review is required. This study is focused on finding out the impact of advertising on consumer buying behaviour. This paper also clarifies the structure of a connection amongst the independent and dependent variables. Therefore, this study can be considered as Causal or Explanatory research. Explanatory research shows a connection between factors and also the course of the relationship. The sampling method that was used in this research is ‘random sampling method’. Students, professionals and aged people were considered for the survey. The age limit was minimum 18 years. The data was mainly collected among the people from different parts of Dhaka city, which is the capital of Bangladesh. The data collection took place from November 2017 to March 2017. A closed survey comprising of 21 items were presented to the respondents and asked to give their opinion. In some cases, for better understanding of the respondents the questions were translated to the native language (Bengali). Any queries and problems in understanding the questionnaire were resolved by the interviewees immediately. For this study a total of 620 consumers were approached. Among them, 544 surveys were used for the analysis. The response rate however was approximately 87.74%. The remaining 76 questionnaire were eliminated due to some errors such as, being filled in incorrectly or were left incomplete. The analysis for this study is based on 544 respondents. Among them, 57.5 % (313 participants) were male respondents and 42.5% (231 participants) female respondents. In terms of gender, among the 544 respondents who participated in the survey, 210 (36.9%) were at the age range of 18 to 25 years; 163 respondents (30%) were at the age range of 26 to 40 years; 107 respondents (19.6%) were at the age range of 41 to 60 years; and 73 (13.4%) respondents were aged above 60 years (Table 1). In this research, the analysis was done using statistical software SPSS, version 20. To check the reliability of factors, internal consistency coefficients (Cronbach’s Alpha) were assessed. According to George and Mallery (2003), reliability coefficient of 0.7 is acceptable, more than 0.8 is good and more than 0.9 is considered excellent. The reliability scores in this research were: Entertainment (0.7), familiarity (0.71), social imaging (0.765), advertisement spending (0.765) and consumer buying behaviour (0.747). It shows all the variables have the Alpha value in the ‘acceptable’ range (George & Mallery, 2003) (Table 2). We can measure the relationship among the independent and dependent variables with Pearson test. According to the Table 3, the correlation (r) of Entertainment is 0.440, Familiarity is 0.460, Social Imaging is 0.364 and for Spending is 0.344. This indicates a significant positive relationship between the independent variables and the dependent variable, Consumer Buying Behaviour. The table also shows that for all the variables, the p-value is 0.000, which is less than 0.01. Therefore, the null hypothesis in this research can be rejected and concluded that there is a positive relationship between the independent variables and dependent variable Consumer Buying Behaviour. SPSS uses a single asterisk (*) to indicate whether a particular correlation is significant at the 0.05 level and a double asterisk (**) to indicate whether a particular correlation is significant at the .01 level. Significance indicates that it is significantly different from 0 (zero), which is the Null Hypothesis. According to Table 4, R2=0.331 which means the independent variables express the dependable variable 31.1%. The Analysis of variance (ANOVA) table below determines the overall significance of the model. Since the P value in the table is <0.05, we can say that the model is significant. The results from the co-efficient table (Table 5) show the level of significance for each variable. From the table below, we can see that all the IVs have significant impact on DVs as the p-value for all three independent variables are p<0.05. The standardized Beta value shows that among the four independent variables, Familiarity has the most significant impact with 29.3%, followed by Entertainment (25.9%) Advertising Spending (12. 1%) and Social Imaging in Advertisement (11.2%). This study shows that there is positive impact of all the variables on consumer buying behaviour. This means that advertisement does in fact affect the buying behaviour of consumers. Among the four independent variables however, we can see that Familiarity and Entertainment have the most significant impact. So, we can see that the psychological impact that Familiarity has on consumers does in fact lead to positive buying behaviour. In this case, most consumers have also taken Entertainment as a positive indicator towards a brand rather than negative. ‘Advisement Spending’ comes in third in terms of significance. This implies that people’s association with ‘Spending’ and ‘Brand’ is likely to lead people to buy a product. In other words, advertisement spending is somewhat successful in persuading people to make a purchase. Social Imaging in Advertisement is seen to have the least impact. It means that people’s desire to belong to a certain group sometimes makes people buy a product. But consumers are more concerned with other factors rather than the ‘social imaging’ in the advertisement. Consumers are more motivated to buy a product when they see an advertisement of it somewhere; they also feel safe to buy a product that they have seen advertisement of. Consumer develops a level of trustworthiness for a brand they have seen advertisement of. They were even noted to collect information of products from advertisement, get to know about the usage and benefits of product and then make a purchase decision based on that. Therefore, advertisement is a very good marketing tool for generating more sales. Some limitations of this study ought to be addressed. Firstly, the sample size could have been more if we had access to a larger number of people. Secondly, it would have been more desirable if we could get hold of people from a diversified age group especially, the older age group of above 60 years. It would have been more interesting to know more about their thoughts on modern advertising. Thirdly, this research could have included a more diversified range of variables to analyse the same topic from a different perspective. This research was a study on the impact of advertisement on consumer buying behaviour. For this purpose four independent variables, Entertainment in Advertisement, Familiarity of Advertisement, Social Imaging in Advertisement and Advertisement Spending were considered. Based on the analysis it can be concluded that advertisement has significant impact on consumer buying behaviour. This study can be helpful for marketers to understand what triggers a consumer’s intention to purchase. They can determine which element in advertising is most effective and which has comparatively lower impact. Although this research can make significant contribution to literature but for future study qualitative data can be used. Qualitative data will provide further insight into the relationship among these variables. Aaker, D.A. & Jacobson, R. (1994). The financial information content of perceived quality. Journal of Marketing Research, 31(2), 191-201. Ahmed, S. & Ashfaq, A. (2013). Imapct of advertising on consumer buying behavoiur through persuasiveness, band image and celebrity endorsement. Global Media Journal, 6(2). Alba, J.W. & Hutchinson, J.W. (1987). Dimensions of consumer expertise. Journal of Consumer Research, 13, 411-454. Archibald, R., Haulman, C. & Moody, C. (1983). Quality, price, advertising and published quality ratings. Journal of Consumer Research, 9, 347-356. Ballester, E.D., Navarro, A. & Sicilia, M. (2012). Revitalising brands through communication messages: The role of brand familiarity. European Journal of Marketing, 46(1/2), 31-51. Barsalou, L.W. (1985). Ideals, central tendency and frequency of instantiation. Journal of Experimental Psychology: Learning, Memory and Cognition, 11, 629-654. Britton, A.M. (2012). The beauty industry's influence on women in society. Honors theses and capstones, University of New Hampshire Scholars' Repository. Burns, K.S. (2003). Attitude toward the online advertising format: A reexamination of the attitude toward the ad model in an online advertising context. Unpublished doctoral dissertation, University of Florida, Gainesville, FL. Chang, C. (2006). Beating the new blues:mood reparir throuth exposure to advertising. Journal of Communication, 56, 198-217. Duncan, C. & Nelson, J. (1985). Effects of humor in a radio advertising experiment. Journal of Advertising, 14(2), 33-64. George, D. & Mallery, P. (2003). SPSS for Windows step by step: A simple guide and reference. Allyn & Bacon, Boston. Gorn, G.J. (1982). The effects of music in advertising on-choice behaviour: A classical conditioning approach. Journal of Marketing, 46, 94-101. Green, A. (1992). Male/female behavioural differences in an advertising sales environment. Industrial and Commercial Training, 24(4), 32-49. Gulas, C.S. & Weinberg, M.G. (2006). Humour in advertising: A comprehensive analysis, M.E. Sharpe, NY. Ha, Y.H., John, J., Janda, S. & Muthaly, S. (2011). The effects of advertising spending on brand loyalty in services. European Journal of Marketing, 45(4), 673-691. Harrison, A.A. (1977). Mere Exposure. Advances in Experimental Social Psychology, 10, 39-83. Hemamalini, K.S., & Kurup, S.K. (2014). Effectiveness of telivison advertisement on purchase intention. International Journal of Innovative Research in Science, Engineering and Technology, 3(2). Johnson, R. & Kellaris, J. (1988). An exploratory study of price/perceived quality relationships among consumer services. Advances in Consumer Research, 15, 316-322. Johnson, E.J. & Russo, J.E. (1984). Product familiarity and learning new information. Journal of Consumer Research, 11, 542-550. Khan, N.G.S., Siddiqui, J., Shah, B.A. & Hunjra, A.I. (2012). Effective advertising and its influence on consumer buying behaviour. Information Management and Business Review, 4(3), 114-119. Khaniwale, M. (2015). Consumer buying behaviour. International Journal of Innovation and Scientific Research, 14(2), 278-286. Kirmani, A. & Wright, P. (1989). Money talks: Perceived advertising expenditures and expected product quality. Journal of Consumer Research, 16(3), 344-353. Kumar, D.P. & Raju, K.V. (2013). The role of advertising in concumer decision making. Journal of Business Management, 14(4), 37-45. Macinnis, D.J. & Park, C.W. (1991). The differential role of characteristics of music on high- and low-involvement consumers' processing of ads. Journal of Consumer Research, 18(2), 161-173. Madden, T.J. & Weinberger, M.G. (1982). The effects of humor on attention in magazine advertising. Journal of Advertising, 11(3). Maheshwari, P., Seth, N. & Gupta, A.K. (2016). An emphirical approach to consumer buying behaviour in Indian automobile sector. Industrial and Commercial Training, 48(3), 156-162. Mandan, M., Hossein, S. & Furuzandeh, A. (2013). Investigating the impact of advertising on customer's behavioural intentions. Business and Economic Research, 3(1). Medin, D.L. & Smith, E.E. (1981). Strategies and classification learning. Journal of Experimental Psychology: Human Learning and Memory, 7, 241-253. Milgrom, P. & Roberts, J. (1986). Price and advertising signals of product quality. Journal of Political Economy, 94(4), 796-821. Moorthy, S. & Zhao, H. (2000). Advertising spending and perceived quality. Marketing Letters, 11(3), 221-231. Nedungadi, P. & Hutchinson, J.W. (1985). The prototypicality of brands: Relationships with brand awareness, preference and usage. Advances in Consumer Research, 12, 498-503. Pollay, R.W. & Mittal, B. (1993). Here’s the beef: Factors, determinants and segments in consumer criticism of advertising. Journal of Marketing, 57(3), 99-114. Ramachander, S. (1988). Consumer behaviour and marketing: Towards an Indian approach. Economic and Political Weekly, 23(9), 22-25. Rosch, E. (1975). Cognitive representations of semantic categories. Journal of Experimental Psychology: General, 104, 1992-2233. Rosch, E. & Mervis, C.B. (1975). Family resemblances: Studies in the internal structure of categories. Cognitive Psychology, 7, 573-605. Russello, S. (2009). The impact of media exposure on self-esteem and body satisfaction in men and women. Journal of Interdisciplinary Undergraduate Research, 1(4). Ryans, C. (1996). Consumer Resources. Journal of Small Business Management, 34, 63-65. Schiffman, L. & Kanuk, L. (2007). Consumer behaviour: A European outlook. Pearson Education, London. Smith, E.G., Lex van., M. & Neijens, P.C. (2006). Effects of advertising likeability: A 10-Year Perspective. Journal of Advertising Research, 46(1), 73-83. Solomon, M. (1995). Consumer behaviour. Prentice Hal, New Jersey. Teixeira, T., Picard, R. & Kaliouby, R. (2013). Why, when and how much to entertain consumers in advertisements? Harvard Business School, Harvard University, Massachusetts. Tiggemann, M. (2003). Media exposure, body dissatisfaction and disordered eating: Television and magazines are not the same! European Eating Disorder Review, 11(5), 418-430. Yoo, B., Donthu, N. & Lee, S. (2000). An examination of selected marketing mix elements and brand equality. Journal of the Academy of Marketing Science, 28(2), 195-211. Zajonc, R.B. (1968). Attitudinal effects of mere exposure. Journal of Personality and Social Psychology, 9(2), 1-27. Zajonc, R.B. & Markus, H. (1982). Affective and cognitive factors in preferences. Journal of Consumer Research, 9, 123-131.